There is nothing more frustrating than spending hours arranging a floral display, only to have everything drooping by the time company arrives. Or worse yet, perhaps you are entering an arrangement in a flower show with your garden club, and the last thing you want is to be embarrassed in front of all the other members. Containing moisture for the flowers. Your first key to success is to choose flowers that are obviously fresh. Often this means selecting those that have a lot of small buds. You will want to calculate the timing so the buds are in the right stage of bloom for your floral display. Avoid flowers that are wilted, tinged with brown spots, or are otherwise damaged. The next step is the most important. You need to condition and store the flowers until you are ready to use them. First cut the stems at an angle with a sharp knife. Experts recommend doing this while holding the stem under running water, especially for roses. Until you are ready to start arranging, place the flowers in a vase of lukewarm water. Remove all leaves that will be under water as this is a prime source of bacteria that will prematurely wilt the flowers. You will also want to keep the water clean by adding two drops of bleach to prevent the growth of bacteria. Others swear by adding a teaspoon or two of gin, which can also come in handy after designing a difficult arrangement. Keep the flowers in a cool place away from heat and light. Most of us would not be able to fit them in our refrigerator, so a basement area is ideal. Change the water every day until you are ready to use them. If you plan to use oasis foam to hold your flower display, soak the foam overnight in water with the holes side down. The oasis will soak up the water and you will be ready to go. Now you are ready to make your floral display. 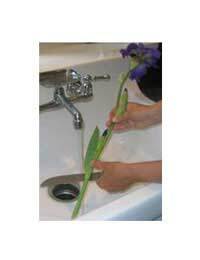 Before putting the flowers in place, snip off the end of the stems again. Make sure everything is thoroughly submerged in water or the oasis. If you follow the above steps, you will have long lasting floral displays that you will be proud to show. Enjoy the fruits of your labor, and don't forget to take a photo for memories that will last forever. I have my granddad funral on Thursday, was told flowers have to be delivered the day before. How long do I soak the Chrysanthemums for before starting as I have little space to store. How long do fresh chrysanthemums take to open please? How manybunches of chrysanthemums do I need to make a letter. Hi I'm making flower reef for mum funeral. I want to use roses what should I use inbetween and how many days before can I do please ? @holly - I'm afraid we have only just got around to seeing your question today due to the weekend break. I hope the flower arrangements have kept for you.